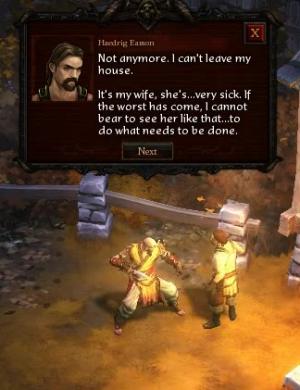 Haedrig Eamon is the Blacksmith Artisan in Diablo 3. 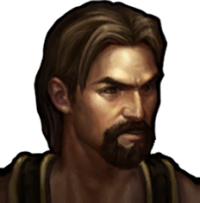 He is encountered in New Tristram, then joins the Caravan and serves as the game's Blacksmith, making weapons, armor and anything that is required for the hero during his or her travels throughout Sanctuary. He also salvages items into Materials that he can then use to fashion the items for you. Salvaging is breaking down equipment into materials. All equipment can be salvaged as long as they were not purchased from vendors. The materials given are based on the items color and whether it is level 1-60 or 61-70. See the Materials article for more information. The Blacksmith does this for free and he requires no training to do so. 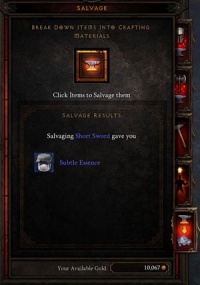 There is a confirmation prompt when the player tries to salvage legendary or set items. Enter can be used to confirm. The Blacksmith can be trained up through 12 levels of proficiency. As he increases in skill he gains new titles and access to higher level plans to craft better items for your characters. His appearance improves as well, with his wagons growing more elaborately-decorated, and more cool stuff appearing in his display. In order train the first level of Rank 10, one Death's Breath is needed, which are only found from level 61-70. The Blacksmith is able to craft weapons and armour as long as you have the correct materials and enough gold. He needs to be trained to learn new plans and the higher level he is the better equipment he can create. Check the Crafting article for more details. The Blacksmith is in some way involved in the following achievement(s). Haedrig was a young husband and father in New Tristram, when the fiery Meteor crashed down through the Monastery. In the chaos and demonic uprising that followed, his wife and child were slain, then returned to half-life as hideous zombies. Brokenhearted over their undead fate, Haedrig beseeches the hero to find them and destroy them, putting their souls to rest. This will be done at the beginning of A Shattered Crown quest. Once the deed is done, Haedrig agrees to use his blacksmithing skills to assist your hero in the battle against evil. Like the other important NPCs, Haedrig travels with the caravan throughout the entire game, and is present in town in each act. During development, many of his talents were redistributed. Haedrig initially socketed items. That talent was subsequently moved to the jeweler, before being removed from the game entirely. Haedrig initially made all repairs. That talent was taken from him and distributed to the other NPC merchants. A Repairs tab was returned to Haedrig in Patch 1.0.4. Haedrig was formerly the source of the Nephalem Cube (used to Salvage items) as a quest reward. That object was removed from the game in the big interface revisions of Beta Patch 10. Four levels of the 10 potential upgrades. This page was last edited on 11 April 2015, at 23:34.